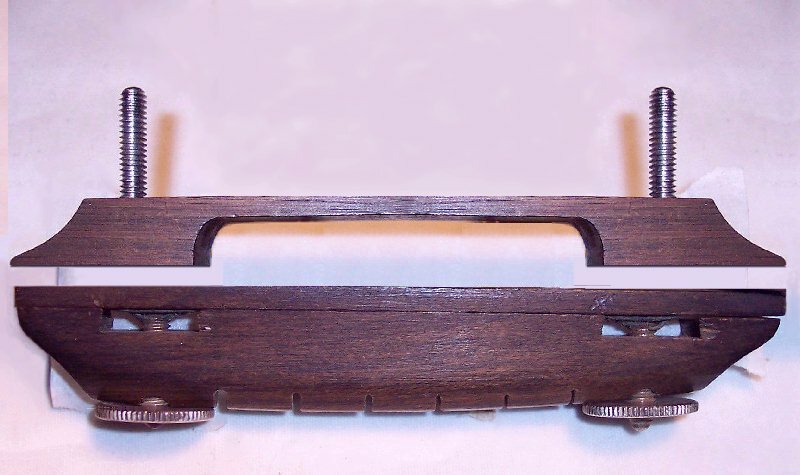 Now that the compatibility of parts has been shown in all the pictures above and thus better understood; Now allow me to further suggest how easy it would be to make a bridge baseplate in the very same manner the original bridge baseplate is made; Which I believe would be a better base plate than the Gretsch's. Rosewood blanks are quite available and quite affordable. It only requires measuring, marking and cutting the baseplate from the blank, ....then measuring, marking and drilling the holes for the screw shafts, and drilling counter conical counter sinks for the screws heads; Then inserting the screws and mounting the blind threaded clip nuts and tightening it all down ! The pictures below show the entire process. Also refer to all the pictures on this page to familiarize with the parts and comparisons with the old original bridge & bridge plate. I suggest the the fore / aft width of the new base plate be made the same as the fore / aft width of the roller bridge, while the lateral width should be the same as the old original bridge plate. NOTICE that the method below could be made for the Gretsch bridge or any of the much more affordable roller bridges available at Allparts and / or Stewart McDonalds. (1) The bridge had separated from the plastic glue that secured it to the pickguard for vibratio operation. (3) The bridge could not be reglued over the hard and distorted (3 dimensionally rough) old plastic glue. (4) The original plastic glue's old dried chemical bond with the pickguard could be construed as damaging the pickguard by distorting it's surface. (5) It took me about 12 hours work to remove the old glue by repeatedly masking, sanding, compounding and refacing the pickguard and bridge bottom. (6) If the same type of chemically bonding plastic glue is used again, the same problem will exist if / when the bridge separates from the pickguard again. 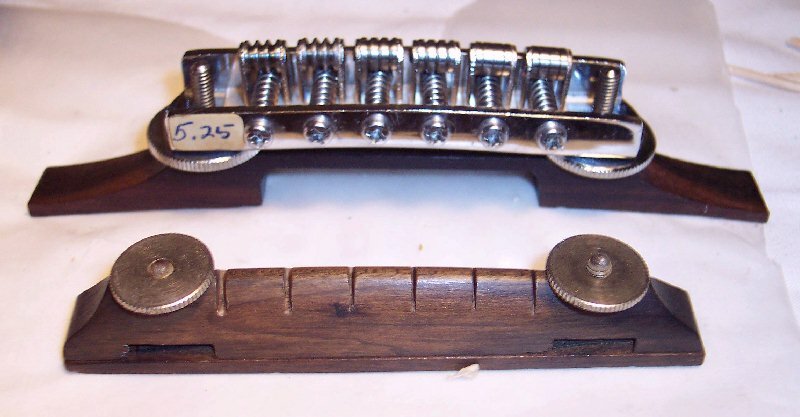 (7) Intonation position of the bridge would change with changing to different string gauges. 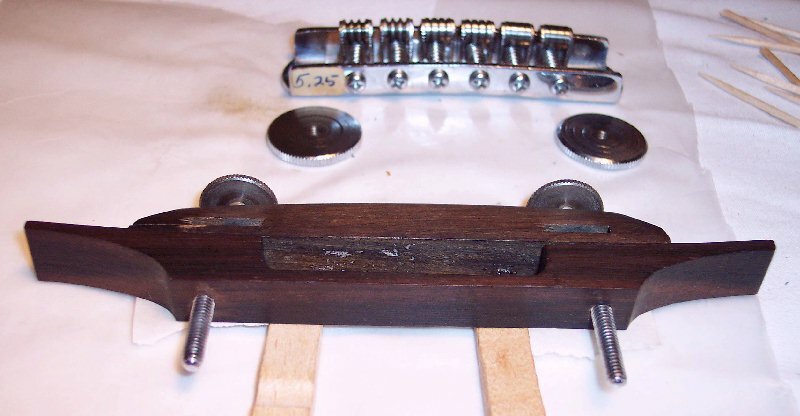 (1) Use a modern high quality glue that will form a strong mechanical bond not needing a chemical bond, to glue the original bridge into place once intonation position is determined and marked with a masking tape perimeter. Franklin Tite Bond is the glue preferred by many if not most Luthiers and Guitar Technicians to bond wood to plastic and vice versa. CLICK HERE to see Franklin Tite Bond properties published by the #1 Luthier supply company, Stewart McDonalds, and HERE for it recommended by Dan Erlwine for dissimilar materials bonding. I would put a strong strip of tape onto the bridges position, custom cut the same size as the bottom of the bridge, and glue the bridge to the tape. That way the bridge would stay in place but could still be peeled off, yet the bottom of the bridge would still need cleaning the tape and glue off to reset the bridge in the future, such as changing string gauges, or even changing to a different string manufacturer to a lessor degree. Glue is just not the best way to solve the problem of having a bridge that will operate with the vibrato and still be easily moveable or intoneable for different gauge and even different manufacturers metal formulas for same-gauge strings. I DO NOT WANT TO GLUE THE BRIDGE DOWN IF A RETROFITTED ROLLER BRIDGE IS GOING TO BE MADE / USED. If I am to glue the bridge on, then I will do it with the tape method said above, unless directed otherwise. Here is a picture of the roller bridge and the original bridge. $5.25 ! ! ! ! It's the price tag of a music store that went out of business about 20 years ago and had a Sale on everything in the store. My how prices have gone up since ! You'd probably pay at least 30 times that much for one today if you could find one ! These were made for use with a vibratos. Each saddle piece rolls on axles. This bridge is in NOS Mint condition and the rollers spin freely with the slightest finger movement upon them. This view shows that the bottom of the roller bridge's base plate would have to be sanded flat and it's ends shortened to replace the original bridge. OF COURSE the original bridge should be saved and stored so it won't be misplaced. The original bridge's thumbwheel height adjuster also fits the Gretsch bridge, should it be found that the smaller wheels work or look better. The width of both bridges' base plates are the same. Here the longitudinal profiles of both bridge plates can be seen. This is my computer Artwork of how the Gretsch's bridge plate could be flattened, and both it's width and height shortened. The height of the legs would depend upon matching the total bridge height to a median height-adjustable height position. That might turn out to be a flat piece like shown farther below. New bridge plate sized, drilled and counter sunk for screws. Nut plates used for securing screws. Thin nuts and thin washers & lock washers could also be used. Both screws in place just like the original bridge. The Gretsch roller bridge top on the custom made plate. The plate could be made to fit any other similar roller bridge.